Millions more Americans were uninsured at the end of 2017, the first increase since the Affordable Care Act went into effect. The uninsured rate rose 1.3 percentage points to 12.2% last year, according to the Gallup-Sharecare Well-Being Index. That represents an increase of roughly 3.2 million Americans. 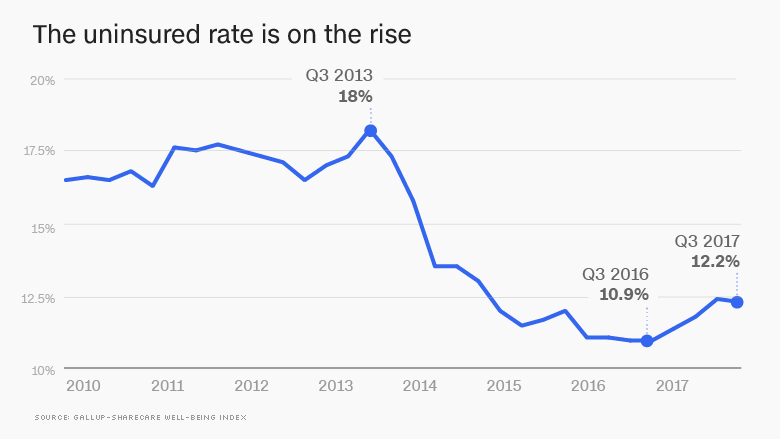 Under Obamacare, the uninsured rate plummeted to a low of 10.9% at the end of 2016. Obamacare's exchanges opened in 2014, the same year Medicaid expansion began and the individual mandate -- which required nearly all Americans to have insurance or pay a penalty -- took effect. Those provisions helped reverse a soaring uninsured rate, which hit a peak of 18% in the fall of 2013, fueled in part by the aftermath of the Great Recession. Several factors likely contributed to the increase last year. President Trump and congressional Republicans tried repeatedly, but unsuccessfully, to repeal the landmark health reform law. That may have led some Americans to question whether the administration would enforce the penalty for not having insurance, according to Gallup-Sharecare. Also, many insurers withdrew from the exchanges and the remaining carriers raised their rates, which may have prompted some consumers to forgo coverage. 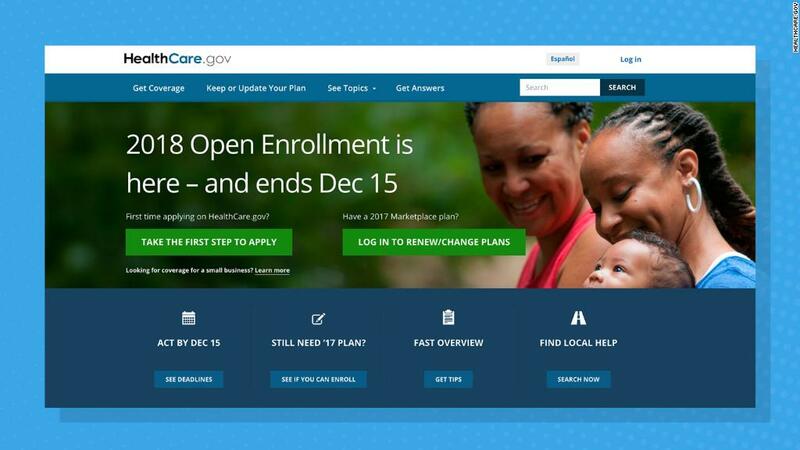 Some 500,000 fewer Americans signed up for 2017 coverage on the exchanges at the end of open enrollment a year ago. The uninsured rate rose for all demographics last year, except for senior citizens, who all qualify for Medicare. Young adults age 18 to 25 and Americans earning less than $36,000 each saw a 2 percentage point increase. The rate for blacks soared 2.3 percentage points, while Hispanics saw a 2.2 percentage point jump. The annual increase is the largest single-year jump since Gallup and Sharecare began tracking the uninsured rate in 2008. And, while the individual mandate remains in effect this year, consumers will no longer have to pay a penalty for being uninsured starting in 2019. Congress effectively nullified the individual mandate by setting the penalty at $0 as part of the tax cut bill that passed last month.